I ran across this 1995 300ZX on craigslist a few days ago. I had emailed the owner when I first saw it to find out if it was a 2+2 but never heard back so I had forgotten about it. I noticed the link in my browser history and clicked on it today and recalled that I hadn’t followed up on this one. I still can’t tell for sure from the photos if it is a 2+2 or not, it seems like maybe it’s not but I definitely need to find out. If it is then I have some quick research to do (VIN look-up) and then decide if I want to put in an offer on it. I could definitely go for a black car even though the pictures confirm to me more than ever that the interior on all U.S. models is gray or charcoal I believe it is called. As I have mentioned though, my plans include to one day redo the leather and suede in the interior to be a dark tan color so the color of the leather is a non issue. The color of the other plastic parts in the interior though, that is an issue. I think a black car, when it is clean, is one of sleekest colors you can get. The “when it is clean” part is where it gets tricky; they tend to get dirty pretty quickly. 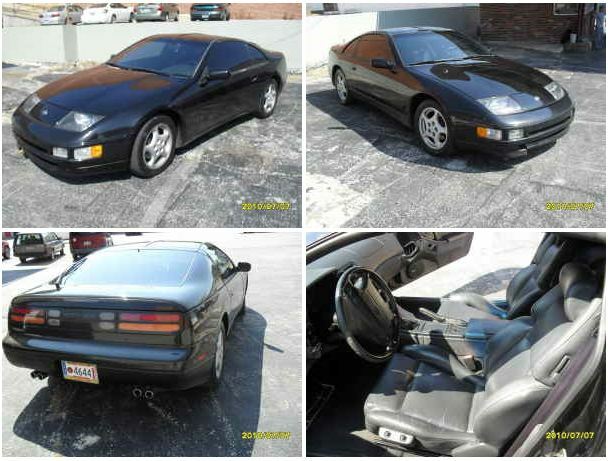 I’ll for sure continue to follow up on this Z32 while keeping my eyes peeled for any more that come available. I almost wish I had the patience to wait until the fall or winter when the prices on some of these might drop but then I think that there might not even be any available at that time. Perhaps if I did wait though I would get lucky and there is some great dad out there who currently owns a 1995 Red 2+2 who will need to buy his kids some awesome Christmas presents and have to part with his beloved vehicle… a man can dream. Reality is, I’ll never wait that long!